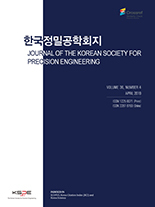 Mingyo Seo, Woosub Lee,(2019).Study on Mobility of Planetary Rovers and the Development of a Lunar Rover Prototype with Minimized Redundancy of Actuators.한국정밀공학회지,36(4),339-348. This paper reviews design elements and presents a mobile platform that has full access of wheel actuation for explicit steering with a minimized number of actuators. For the purpose of exploring lunar surfaces, there are two main design perspectives to be considered. First, the mobile system should guarantee traversability on rough terrain in microgravity condition. Secondly, the system should be sustainable in the extreme environment of the lunar surface including cosmic rays and excessive temperature changes. One of the potential solutions to improve the reliability of the rover system is to reduce the chance of failure by minimizing the number of electronic components including actuators and their following components and installing them in the rover’s warm-box. We approached the design of the mobile system in the aspect of its kinematics with assumptions of pure-rolling and non-lateral slip. We found a relation that a pair of front and rear wheels on the same side is coupled so that their alignment and rotational speed can be coupled by a mechanism. This allows advantages of explicit steering, minimizing redundancy of actuators and isolating all the electronic components from the effects of external environments. To demonstrate the feasibility of the system, we developed a rover testbed and presented its mobility of explicit steering by experiments of open-loop trajectory traveling.